It’s going to be a scorching hot summer in Québec City. In about a week the Philadelphia Flyers will put an end to the providential media blackout provided by the Habs’ unexpected early playoffs successes and Jean Charest’s Liberals, already busy with Mulroney-scale allegations of corruption, will also have to deal with their very first full-scale language crisis. And if the word on the WiFi is true, Charest might just be about to take Québec’s already schizophrenic linguistic situation straight through the looking-glass. Y’all of course remember that last year the Supreme Court of Canada invalidated Bill 104, a law that closed a loophole used by wealthy families to purchase the right to send their kids to English-language public schools, a privilege that in the spirit and letter of Québec’s laws, is supposed to be reserved for Québec’s historic English-speaking minority. The Supremes essentially agreed that closing that loophole was a legitimate objective, but decided that the technicalities of Bill 104, the idea that all the time a student spent in a unsubsidized private school didn’t count as education in Canada, was too much. It gave the Québec bureaucrats one year to find a better way to close the loophole. Evidently this is harder than it sounds and Charest government already missed its deadline. Emboldened by a recent poll that suggests that for the first time in decades Québec Francos would support giving themsleves the right to send their kids to English schools, some are asking the Liberals to take this opportunity to give… everyone except Québec’s Franco’s access to English schools. One of the solutions to the English schools demographic « decline » peddled by School Board—and appalingly getting support in some sovereigntist circles—is the right to public education should be extended not only to families who have received an English education somewhere in Canada, but also to those who have received this education in « English-speaking countries » such as the US or the United Kingdom. Notice the two countries that inevitably come up when that solution is proposed: the US and the UK. What about Jamaica, South Africa, Belize, Nigeria and Cameroun? An arbitrary choice of countries could never be justified on any objective moral grounds and would inevitably be struck down in courts as discriminatory. Eventually, the right to a subsidised English education would have to be extended to the children of parents who have been educated in English not only in Canada, but « to any children with at least one parent educated in English anywhere on Earth », as the Montreal Gazette suggested. In other words, instead of closing a loophole that enabled wealthy Québec Francos and immigrants to purchase the privilege of a subsidized English education in Québec, these people are suggesting that we take the racket global! Because make no mistake about it, « elsewhere on Earth » an English education is a privilege of the wealthy. In places like Pakistan, India, much of Africa and Asia, sending their children to exclusive private English-language schools is the local elites way of making sure they have first dibs on all the good government, justice and army brass jobs. It is possible to argue that Québec’s English-speaking community has historical rights to its own institutions. But we would now be extending these rights to ALL English-speaking people, anywhere on Earth. Québec, of all places, would be the first Nation in the world to treat ALL THE WORLD’S ENGLISH-SPEAKING PEOPLES as a minority in need of special protection! And all the Francos in the English language school board’s poll that want greater access to English schools? Too bad. They’d still be locked out. Special Black History Month edition AngryBoys and Girls. It’s the story of Michel Adrien and Ulrick Chérubin, two buddies from the town of Jacmel in Haiti who both ended up as mayors of Mont-Laurier and Amos, two lumberjack towns of Québec’s North West. The story of both men starts in the late 60 and early seventies when a whole generation of scholars, professionals and intellectuals was chased out of Papa Doc Duvalier’s Haiti. Quite a few of these men and women came to Québec where they found a surprisingly familiar society that spoke French and shared their catholic faith. Québec was also a society that, unlike Haiti, was now moving on after the long reign of it’s own tyrant, Maurice Duplessis. Michel Adrien came to Québec in 1969 and took a job teaching high school physics for a year in Mont-Laurier, a small city of some 13 000 souls in the Laurentians. Québec’s Quiet Revolution had lead to massive education reforms and there were many jobs jobs for all those who were willing to do a tour of duty in the woods. He remembers the Mont-Laurier of the late 60’s as an effervescent regional hub. 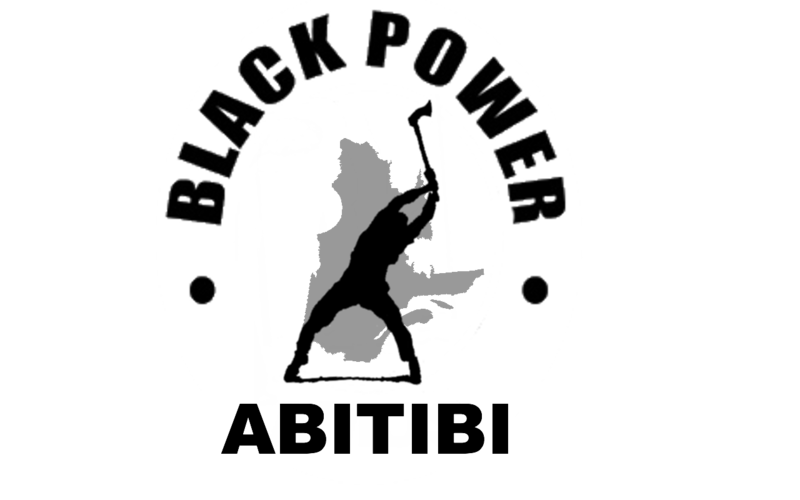 Black people were rare, but not unheard of as many came to work in the many government agencies in town. Michel Adrien’s childhood friend, Ulrick Chérubin, came to Canada a few years later, to a New Brunswick seminary where he studied to become a priest. The seminary closed and he moved to another seminary, in Trois-Rivières. There he met a woman that asked him he had ever thought of being a father instead of a priest. “I told her I had never considered it”, he lied. After leaving the Church, which was a very fashionable thing to do in those years in Québec, Chérubin recycled his theology credentials into a teaching career. Like his friend, he headed north, to the small city of Amos in Abitibi. Amos is almost exactly the same size as Mont-Laurier and is also dependent on the forestry industry. Chérubin’s political career started after retirement, following a dream in which his deceased mother reprimanded him for watching to much TV. In 2002 he was elected mayor with an ultra-thin majority of only 50 votes. A year later his childhood friend Adrien was elected mayor of Mont-Laurier. In 2005 Ulrick Chérubin was re-elected, his time with a record-breaking 84% of the votes. Québec’s Haitian community is usually associated with the urban neighbourhoods of North East Montreal, but there is actually a surprisingly long history of Haitians not only living , but becoming political leaders in Québec’s and French-Canada’s remote communities. The first black mayor in Canadian history was Dr. Firmin Monestime, an Haitian who was elected in the little bilingual logging community of Mattawa in Northern Ontario in 1964, only one year after Martin Luther King’s march on Washington. The first black mayor in Québec was René Coicou, another Haitian who in 1973 was elected in Gagnon, an ultra-remote mining town half way between Montréal and Irkutsk that was shut down and evacuated in 1985. Another Haitian political figure is the Parti québécois’ Jean Alfred, the first black member of Québec’s National Assembly, elected in the Outaouais ridding of Papineau in 1976. Could being one of the few visible minorities in an area where people from a different postal code are foreigners actually be an advantage in the highly public profession of politics? 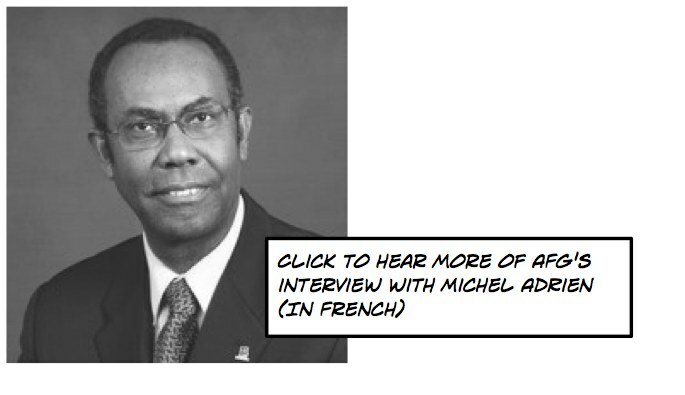 The 1970’s were a time of tremendous political and social upheaval in Québec and there were plenty of opportunities for adventurous immigrants like Michel Adrien and Ulrick Chérubin, especially since, at that time, the Haitian community had yet to set deep roots in Montréal, or anywhere else. But times have changed. The forest industry is in crisis. There are few jobs in Amos and Mont-Laurier, today. For immigrants or anybody else. There are two schools of thought in Québec when it comes to the historical significance of the British conquest of 1759. The so-called Montréal school of thinkers consider it was a historical, economic and social tragedy that stunted the development of French-canadian culture and society. According to the Québec school of thought it spared Québec from the chaos and violence of the French Revolution and gave it access to British government and democracy. I’m more partial to the second school’s interpretation. The conquest did result in two centuries of rule by a lunatic papist theocracy propped up by a cotery of racist British robber-barons, but at the end of the day, we’re still here, we’re still speaking French and we can only imagine how much bloodier things would’ve been if New France had been conquered by the Spaniards or the Dutch. The conquest was a thing. It happened. What are you gonna do about it? We’ll I know at least one thing I wouldn’t do about it is celebrate it. Yet, that’s exactly what Québec City is getting ready to do. 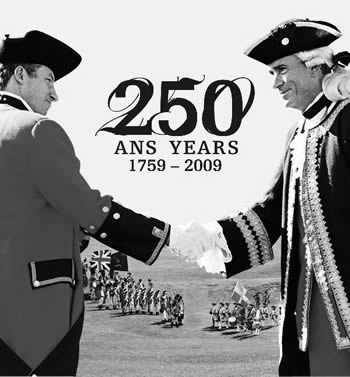 The National Battlefields Commission is organizing a full-scale re-enactment of both the battle and the siege of Québec this summer to commemorate the 250th anniversary of the British Conquest of New France. I get it. The whole thing is historically-minded. There’s going to be conferences by scholars. The website says they are ‘marking’ the anniversary, not having a party. The poster for the event shows two smiling generals shaking hands and the program includes a comedy cabaret with Wolfe and Montcalm impersonators. Yet you have to be seriously clueless to think that a full-scale re-enactment of the mother of all of Québec’s many historical traumas and unresolved ‘issues’ is going to go down without drama. Come on! It was only a few months ago that some people nearly lost it because Paul McCartney went on the Plains to sing in English! I can already imagine the the battalion of Jeunes Patriotes with flags and gaz masks charging the middle aged suburban Americans in tights playing the role of the british troops. Maybe Amir Khadir will attack the Wolfe impersonator with his shoes. This said, I do think they have a point. The Conquest is a very emotional and significant historical event. In the country with the Occident’s strongest and best organized secessionist movement, you’d think people would take that into consideration. Compare this to the emotionally charged and masterfully played lead up to Barack Obama’s inauguration. This week we saw the president-elect re-enact the train trip Abraham Lincoln took to Washington on the eve of the Civil War and a massive concert was held in front of the Lincoln monument where Martin Luther King gave the most famous american speech ever. All of this evokes slavery, civil war and segregation, but in the context of the the first black president’s swearing in, America is actually creating a brand new historical moment. A moment of reconciliation. Over here the Canadian government thinks it can defuse the memory of the Conquest by treating it like the emotional equivalent of the war of the Peloponese and turning it into a vaudeville. This is the opposite of what the Americans are doing. This is trivializing the past. It is disrespecting the many Québécois who still have the memory of the consequences of the Conquest stuck in their throats. Next year: the re-enactment of the American Indian genocide! Stephen Harper and his wife Laureen are in Paris. It’s about midnight and there is no one around. Stephen holds up a small piece of paper with an address on it, not sure he’s at the right place. -I told you it’s too late, Stephen! Everybody’s gone! -Trust me honey, this is when French parties get started. We’re fine. Stephen sees a man smoking a cigarette and walks up to him holding his piece of paper. -Exkweesay moi, savay vous oo ey l’Eleesaye? The man smells like cigarettes and Pinot Noir. He doesn’t even look at the piece of paper. He just shakes his head. -Stephen Harper. Never thought I’d see the day we’d be at the same party. -AngryFrenchGuy! I thought you looked familiar! -Stephen Harper, the friend of France! Who would’ve thought? Trudeau was never a friend of France. Chrétien was never a friend of France. And then you, the rigid policy wonk from Calgary, you’re the one who gets the president of France to declare: “Our friends, the Canadians, our brothers, the Québécois”. Way to make it with the cool kids, neighbour! -Don’t forget he also said he prefered a united Canada! -Yeah, yeah.. whatever. C’mon I’ll introduce you to everybody. -Are you sure it’s this way? -Hey. This is my cousin’s house. AngryFrenchGuy, Stephen and Laureen walk up the stairs to a vast room filled with people and cigarette smoke. EuroHouse music is playing very loud. AFG points over to a small gray-haired man standing by himself in a corner. -That’s George W. Bush over there. -Wow. I thought France and the USA we’re not getting along! Darn, even Republicans don’t want to be seen with Bush anymore! -He said Bush was family...? -Check it out! See that guy over there with the soul glow hair and the hot female bodyguards? That’s Colonel Mouamar al-Ghaddafi! -Gaddafi? I thought we weren’t talking to him? -Sarko is talking to him. He’s a friend of the family. He invited him to France for his first official visit in 34 years. He also negociated with him for the release of those Bulgarian nurses. -But you can’t negociate with terrorists! That defeats the whole purpose! 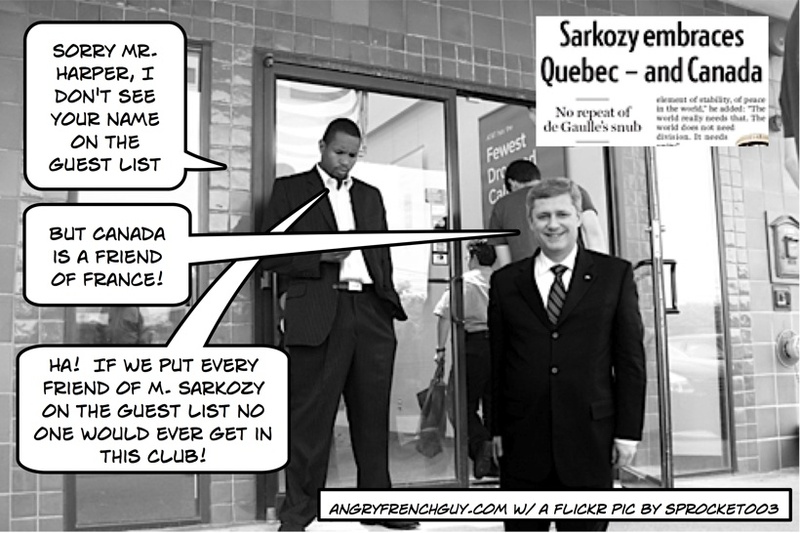 -Sarko also talks to them all the time. When he was mayor of Neuilly there was this guy called the Human Bomb who took an entire class of schoolchildren hostage. Sarko negociated with him on TV! -On TV!? That’s dangerous! A head of State just can’t go around talking to anyone, giving them credibility! -Sure he can! Check it out over there: That’s Alvaro Uribe, the president of Colombia. Sarko talks to him. And over there in the fatigues, that’s the Colombian revolutionaries of the FARC. Sarko also talks to them. Oh! come here! AFG grabs Stephen’s hand and drags him over to two angry looking men with red, white and blue ribbons accross their chests. One is old and sitting, the other is middle aged and standing. -Stephen, I’d like you to meet Jean-Marie Le Pen, leader of the Front National and Vladimir Poutin, President of Russia. -Le Pen? You can’t be a friend of Sarkozy! -I am not. He eez a dirtee immigrant. -But why are you at his party? -I have to come here to see my friends, now. Before, ze other partees they leeve me alone with my supporters. This Sarkozy he openly copies my ideas and reeche out to my supporters. Stephen can’t finish his thought because Vladimir Poutin has him in a jiu-jitsu hold and has his face 2 centimeters from his own. -You listen. Sarkozy is good man. He is only western leader who call me when I have big electoral victory in 2007. No one else call me. Be careful what you say. Sarkozy is my friend. Poutin eventually let’s go of Stephen and he and AFG walk back towards the stairs. Stephen turns towards AFG. 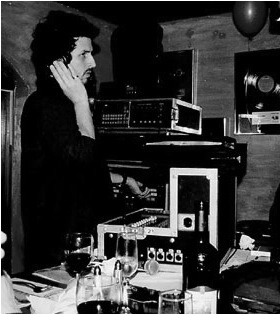 -Listen, AFG… I’m going to go, now. I’m just not comfortable with this crowd. I thought this was a good move, you know, normalizing Canadian relations with France and getting the French president to support a united Canada… But I’m not so sure anymore. I mean, this guy will be friends with anyone! It’s ridiculous! How can YOU be friends with him? The separatist threat is over. This is the new conventional wisdom in Canada. Québec’s independence? Old news. Problem dealt with. Taken care of. The latest polls show that support for independence is at it’s lowest in decades. Only 36% of the Québécois would vote for sovereignty according to an April 2008 poll by CROP. Léger Marketing counts 42% (google English). Well… you know what they say about numbers and what we can make them say. Now, French-speakers in Belgium have always had a slightly odd way of counting, different from the way other French-speakers count. Ninety and Seventy, for example, are in French Quatre-vingt-dix and Soixante-dix, but not in Belgium. Over there they say Nonante and Septante. Apparently the perception of numbers is also different in Belgium. In Canada when 42% of the Québécois support the secession of Québec it means the movement is moribund and agonizing. In Belgium, when 49% of the Flemish say they support the independence of Flanders, the country is thrown into the worst political crisis of it’s history. Of course, the situations in Québec and Flanders are very different. Over there, the crisis is the result of Prime Minister Yves Leterme’s failure to reform the country in a way that would give Flanders more autonomy whereas in Québec, Trudeau’s constitutional reforms and Mulroney’s Meech Lake accord have… left Québec pretty much in the same situation where it was when the “troubles” started 40 years ago. In the very heated context of a political crisis that has been going on for years and the very fresh rejection of Flemish autonomy by the French-speaking Wallons, half of Flanders wants out of the kingdom of Belgium. In a still favourable economic climate, with a governement that panders to the nationalists and after four decades of “referendums, constitutional battles, separatist threats” that have “drained the national spirit”, “curbed foreign investment” and “sidelined other national priorities”, between one third and one half of the Québécois STILL want independence from Canada. There is no way those numbers could go back up again, right? French-speaking Montrealers are feeling very secure linguistically right now, aren’t they? And there is no way the 55 000 new immigrants the Québec governement wants to recruit every year will have any effect on the demographic balance on the city either. Of course not. And as the people of Québec watch their manufacturing sector collapse in the wake of the American economic meltdown, they will surely find comfort in the fact that they can always flee Québec and it’s horrible language laws for the riches and linguistic freedom of Alberta. How could any of this ever flare up into a rise of support for Québec’s independence? Thank God for Canadian Math. The Other Option. Think Big. What if Québec joined the United States of America as the 51st état? One of the very few argument for Canadian federalism that actually has any effect on me is the fact that out of Canada, Québec would lose it’s shared position in some more prestigious international forums, notably the G8. You have to admit that the sight of a country lawyer from Shawinigan hanging out with Jacques Chirac and Tony Blair does make you think twice about trading that seat for the satisfaction of having one of our guys between Quatar and South Korea at the UN. But if you use that logic, why should Québec satisfy itself with being part of Canada. Why not join the United States? If Québec is not to become an independent country and if it is to remain a part of a federation, why not join a real one? If you’re a small people destined to be a minority in any political or economic structure, then why not go Major League? Why vote for the government of a pretend country if you can vote for the real thing? Why send our guys to Ottawa if we could send them to Washington? The 49th parallel is not real, it’s a fictional line in the sand. In any case the 49th parallel is not even the border between Québec and the US. Nobody actually knows where that border is since most markers were swallowed by the forest years ago. The economic frontier between the Québec and the US is a just as much of a myth and it ceased to represent anything real since way before NAFTA. Close to half of Canada’s economy is foreign-owned. That’s not a disaster, it’s globalization. The disaster is pretending the Canadian government can do anything about it. Remember the softwood lumber crisis? It took the Canadian government years to achieve a barely face-saving deal. How long do you think it would have taken to resolve it if Québec had 15 electoral college votes in its pocket? An État du Québec would be the 12th largest state in the Union, right between New Jersey and Virginia. That means about 12 House seats and 2 almighty senate seats. A real elected senate. A single US senator has about the power of the entire canadian senate plus the provincial legislatures of Manitoba, Saskatchewan and PEI combined. As it is the Canadian government doesn’t even have enough pull to get a 15 year old kid soldier arrested for throwing a grenade at American soldiers out of jail. If Omar Kahdr had been an American citizen he would never have been in Guantanamo in the first place. The American government didn’t send it’s citizens to Guantanamo. Actually, if the 7 million Québécois had voted in the 2000 presidential election there would have been no president Bush, no Irak war, no Guantanamo. Get Québec in the United States. Save the world. Of course, Québec would have to make some compromises. The American Federal government will not make French an official language all over the US, but since Canadian Official Billingualism is not much more than Welcome/Bienvenue signs outside Québec, it wouldn’t actually be a huge change. In the US French would not be an official language at all, but then English is not an official language either. Equality at last! At the provincial – I mean State – level, Québec could keep pretty much the same linguistic regime. There are already 27 states that have made English their official language, Québec would keep French as its official language. And as a bonus it would be relieved of the appalling constitutional obligation to “promote and protect” the language of it’s English-speaking “minority”. Joining the US would not be a huge deal for most Québécois in terms of their culture. Not being American is not a central part of our identity the way it is in the Rest of Canada. Feelings and attitudes toward the US change over time but beyond opposition to specific issues like the Irak war, there is not the same type of self-righteous contempt towards the Americans that is very common in other parts of Canada. Many Americans would welcome Québec into the union with enthouisasm. Hey, seven million Québec votes could actually be just enough to tip the political scale to the the progressive side of issues in the States. The Québécois support the right to choose and universal health care. God knows how strongly we feel about keeping him out of schools. Québec might be to the left of the American political spectrum (although not quite as far left as it’s neighbor Vermont), it would probably not have such a hard time finding common ground with the boys down south. They certainly wouldn’t have anything against fellow former secessionists joining them in the fight for state rights and the struggle to keep the Federal government out of local affairs. In fact, I suspect a few of les gars up here would not be against the concept of a constitutionally protected right to form armed militias.. Speaking of minorities, the admissions of French-speaking Americans in the Union can only help the political empowerment of the new linguistic and cultural reality of the United States that is already very real on the ground. American Hispanics will no doubt welcome the arrival of los Latinos del Norte as allies in the struggle for greater linguistic and cultural diversity in the US.